Are Fresnel lenses widely used for solar electricity? If not, why not? I was just wondering why Fresnel Lenses are not widely used in the production of solar electricity. Their use there would mean that you could produce heat within a fraction of a second, up to a few minutes and run a turbine to produce electricity. This is mainly an engineering & economics question; and we can deal with those aspects of it over on the Sustainability Stack Exchange, if you want. And there is one conceptual physics aspect too. So, the first problem with CPV is that you need a lot of direct light, not just ambient light. Ordinary PV can make do with either. The second problem, is that no PV cell is anywhere near 100% efficient, and although CPV cells have got up to (roughly) 30-45% efficient, that still means that up to 70% of the energy could end as heat. Some will get reflected, but there'll still be 30-50% of the direct light energy going into concentrated heat. And that's all heat on the expensive CPV cell, that you've got to dissipate. The more successful the fresnel lens is in concentrating the light, the bigger your problem in preventing heat build-up, and the higher the equilibrium temperature on your CPV cell. There are several reasons why Fresnel Lenses are not frequently used for solar energy collection; although they can be for small niche applications. Fresnel lenses are inherently single surface lenses; all of the optical power is on the serrated surface. The grooved structure of this surface is easily contaminated , needing frequent cleaning. They are expensive to make in glass, and most moldable optical plastics are UV degradable. The surface contamination problem can be overcome by putting the grooved side on the inside, towards the focus. This is the worst possible way to use a single surface refracting lens; the lens aberration are extremely large, whereas they are not too bad, with the grooved side out. Photovoltaics: These (what are commonly thought of as "solar panels") are generally used without optics. The reason is that they will accept light from nearly any direction, and the power generated is directly proportional to both the surface area exposed, and the intensity of the light. One could use optics to focus light from a wider area onto a smaller amount of photovoltaic material, and there have been some trials of using arrays of small lenses to do this, but in general it would produce no more power than just covering the wider area with photovoltaic material. Whether this is more economical comes down to engineering optimisation (e.g. perhaps it would enable a smaller amount of a more expensive photovoltaic material to be used), but to date most photovoltaics do not use optics. Concentrating Solar Power (CSP): A heat transfer fluid is heated by concentrated sunlight and this heat is used to drive a turbine. At present there are a number of approaches to this. The most prevalent is to use linear parabolic troughs with a heat transfer fluid flowing through a pipe at the focal point. 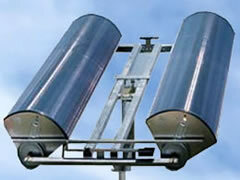 It has been suggested that linear Fresnel reflectors would be more economical, being cheaper to construct for the same receiving area (see http://social.csptoday.com/technology/hovering-wings-linear-fresnel-technology). The second approach is the "solar tower" method, where an array of reflectors is used to focus sunlight from a wide area onto a single tower (example). Normally, tracking mirrors are used to follow the sun across the sky. In some respects one could think of this mirror array as being similar to a Fresnel reflector - the array, seen as a whole, is a relatively flat structure that mimics the optical effect of a curved lens. I seem to recall that there have been some studies on sculpting desert sand into the shape of a fixed Fresnel reflector and painting it white, but I cannot find any links for this, and it may be an idea that rapidly faded! I think EnergyNumbers's Answer is an excellent one, but could leave some people a bit mystified by what exactly a "direct ray" is and what exactly its relevance is. The essential idea here is that a Fresnel lens is an imaging machine: it puts a curvature on a low aberration wavefront so that that wavefront converges. Its working depends on there being approximately plane wavefronts at its input (if it is set up to concentrate light by focussing it) and it is intolerant of aberration. Light scattered from clouds has high aberration wavefronts. There is nothing special about "Frensel"; the following applies to all imaging optics. Consider an unentangled photon coming straight from the Sun (see my footnote): its wavefront is almost plane as it reaches the concentrator from the Sun. There may be a small amount of "twinkle", i.e. the wavefront has been distorted a little through interaction of the atmosphere, but the aberration is small. Therefore the focus can be tight: all the way down to the Abbe limit if there is no aberration. On the other hand, light that reaches us after interaction with clouds has a wavefront that is wildly contorted. Imaging optics simply will not concentrate it, a fact that can be seen in the high sensitivity of a lens's Strehl ratio to aberration. Think of a laser shone at a roughly ground piece of glass: you see speckle. The light is still perfectly "coherent" in the sense of being highly statistically correlated at different points in space and time, but the wavefronts are all over the place and cannot be concentrated by wavefront processing, i.e. by imaging optics. Now rays are simply a way to describe the normal to a light field's wavefronts - indeed the ability to think in terms of rays depends on the Eikonal approximation to the Maxwellian, photonic description I alluded to above. Another way to think of all of this is through the law of conservation of étendue, or the second law of thermodynamics applied to light. Incoming "direct" solar radiation is made up of parallel rays, perfectly aligned. Its étendue, or entropy is nought or very near thereto (Look up the Wikipedia page on étendue for its definition). Scattered from clouds, the input to a concentrator is made up of rays spread randomly in all directions - this is a high étendue configuration. This puts a severe limit on how much such light can be concentrated: the concentrator simply cannot decrease the étendue: the beamwidth can only be losslessly shrunken by increasing the spread of angles in the ray bundle describing the light. So, in EnergyNumbers's Answer, a "direct ray" is to be understood as a member of a low étendue, well aligned ensemble. And, to answer the problem of high étendue light: we build things like photovoltaics which work with unconcentrated light. There is no étendue problem to get around here: photovoltaics simply live with étendue and do not need any concentrator at all (this is not highly related to why photovoltaics are of low efficiency by the way). Footnote: I only raise the "photon" description here as it helps demystify why we can treat a laser or a highly collimated incoherent beam i.e. light directly from the Sun, in exactly the same way as far as imaging optics are concerned. If the photon description of light in these terms is unwonted to you, see my answer to "How can we interpret polarization and frequency when we are dealing with one single photon?". Essentially, when you look at light one photon at a time, a laser beam and a collimated incoherent beam are the same: lone photons propagate by Maxwell's equations and so their field has wavefronts and interference and all the other things we wontedly associate with coherent light - in Paul Dirac's words, each photon interferes only with itself - so it is like a little coherent beam. At least, this thinking works for unentangled photons. Though it is not common to use Fresnel lenses for electricity generation but 100 MW power plant is nearing completion in Rajasthan state of India using linear Fresnel lens technology. So to say that this technology is not feasible for large scale use is not correct and time may come if that above mentioned power generation goes smoothly, the scene may change in Fresnel lens technology's favor. They are not generally used with the photovoltaic cells as they concentrate the sun light and heat to a temperature so high that many of the cells get, for lack of a better word, fried. Not the answer you're looking for? Browse other questions tagged optics energy electricity renewable-energy lenses or ask your own question. Would putting a magnifying glass on a solar panel be beneficial? Why do solar panels not have focusing mirrors? How can we interpret polarization and frequency when we are dealing with one single photon? We just need a solar panelled SPAIN to power the world? Where does electricity go from a solar panel that is not plugged in to anything? Why exactly are images formed by lenses/mirrors? Will the upcoming solar eclipse stress the European electrical grid? Why paraxial rays are used for image construction? Why are spin coated polymer solar cells more efficient? Why can't concave lenses be used as magnifying glasses? Why do convex lenses not disperse light like prisms, given that entry and exit points aren't parallel? How are progressive lenses made to allow for continuous changes in prescription? Can solar mirrors be used for amateur telescopes?